Lee Nelson is comical face and often makes certain acts that can leave an already confused person nowhere. 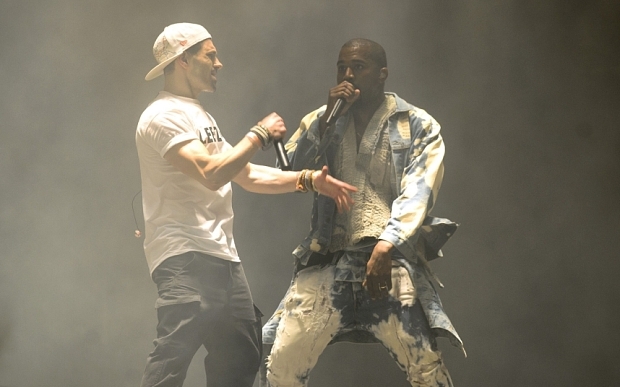 An episode of such kind was seen on the Pyramid stage at Glastonbury when Kanye was lost in his rocking performance and suddenly Lee speeded up to the stage and started dancing with the singer. Kayne perhaps was already confused and this invade by Lee couldn’t let him do anything else but dance with him. Later security persons forcibly removed the comic rogue from the stage allowing the rapper to continue with his show. The English humorist Simon Brodki who is commonly known as Lee Nelson (a character played by the comedian) also provided people a hot topic to discuss about him when he managed to slink into a shoot with the English football team while they were giving pose for the world cup last year. And now he comes in the headlines with his recent funny episode. No one was expecting that Lee Nelson would suddenly run to the iconic stage while the rapper was lost with his fourth song and would try to continue with the song with his comical dancing steps. It became creepy and really disgusting when the black skinhead singer had to break off to get Lee away from the stage before he could restart with his tracks. It is worth mentioning here that Kayne West and his gig at Glastonbury was a hot topic of discussion for many due to some grounds even before the incident happened. It had tens of thousands viewers around the stage making the show one of the most controversial selling in recent times. Moreover, there was an online petition against the American rapper that acquired over 100,000 signatories. A lot of spectators in the festival left feeling saddened with the overvalued Glastonbury set. It was also noted that while playing ‘Touch the Sky’, Kanye left the arena as he had to re-appear being lifted high into the sky on a the stage form above the horde.